A massive racket involving extortion of lakhs of rupees from a number of gullible jobless youths by an artful father-son duo has come to light here following the registration of a case of cheating, forgery and criminal conspiracy. Sikh religious leaders here have decided to eradicate social evils from the community. The resolution was taken after a marathon meeting of Gurdwara Management Committee and Jathedars of Sikh society. They have banned the serving of non-vegetarian meals and solemnisation of wedding ceremony during night. The authorities of the Haryana State Education Board (HSEB) claimed that they had made an all-out efforts to check the menace of copying in the ongoing annual examinations of the Middle Board in the state. However, the ground reality is different. A large number of cases of UMC and arrest of many persons for defying Section 144 imposed around the centres, indicate that the things are not hunky-dory. Goel ‘entering’ MCD schools via backdoor? 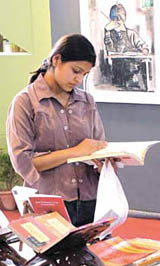 The Delhi Police are seeking the permission of the Delhi High Court to proceed against an Ahalmad (Naib Court) for allegedly appointing a private person unauthorisedly to help him in the paper work in the court of Additional Chief Metropolitan Magistrate, Mr Ravinder Dudeja, at the Patiala House courts here. A miscreant armed with a revolver, who slipped into his neighbour’s house late at night, was beaten to death by the owner of the house. It is reported that the intruding neighbour wanted to molest the women in the house. The incident happened in Neemka village under Javer police station on Thursday. Deputy Prime Minister L K Advani today asked the Delhi Development Authority to concentrate on all-round development of the national Capital and not restrict itself to constructing houses and roads. A youth, identified as Jagdish, sustained serious knife injuries when he was attacked by his brother and two other unidentified persons at Rampur Kundal village, about 25 km from here last evening. We have a similar situation concerning the poor of the land. The middle class holds the reins of power. The poor do not even get the crumbs from their table. And millions are destined to a life of poverty, disease and sickness because the fruits of progress are not yet available to them after more than five decades. Not even the freedom or opportunity to labour with their hands and live a life of dignity and liberty. The Anti-Kidnapping Cell of the Delhi Police, Crime Branch, claimed to have nabbed a notorious inter-state criminal, identified as Dilber Singh. The accused was a proclaimed offender in cases of murder, attempt to murder, Arms Act, cheating etc. Delivering the convocation address of Indira Gandhi National Open University today, the former Chairman, Indian Space Research Organisation and Member, Rajya Sabha, Dr K. Kasturirangan, said the educational satellite EDUSAT is a unique mission anywhere in the world and envisages creating a bridge for providing extensive nationwide outreach for programmes related to education, training and enrichment. 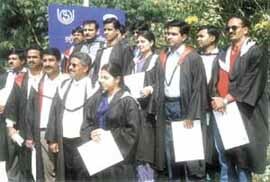 Some of the students who were awarded degrees, diplomas and certificates at the Ignou convocation. The District and Sessions Judge, Mr B L Singal, convicted one Duli Chand of Tihar Kalan village under Section 302 IPC and sentenced him to life imprisonment with a fine of Rs 5,000 for murdering Mr Gulab Singh of the same village on May 8, 1997. In default of the payment of the fine, he would have to undergo further two years of rigorous imprisonment. The Indian Council of Medical Research has made an earnest attempt towards satisfying curiosity about Indian medicinal plants by publishing three volumes titled ‘Reviews on Indian Medicinal Plants. A brilliant all-round display by Sachin Rana (90 n o, 7x6, 7x4, 58b and 6 for 39) enabled Indian Airlines defeat Central Railway, Mumbai by 168 runs and enter the final of the ninth All-India Rani Surya Mukhi Devi Memorial Cricket Tournament at the Digvijay Stadium, Chattisgarh. The Confederation of Indian Industries (CII) will hold a National Golf Tournament at the Jaypee Greens Golf Course, Greater Noida, on February 29. A golf clinic will also be held during the tournament. Around 100 senior corporate golfers are expected to participate in the tournament. The Khushi, an NGO is organising an entertainment event, a double wicket cricket match between cricketers and Bollywood stars at Jawaharlal Nehru Stadium tomorrow. 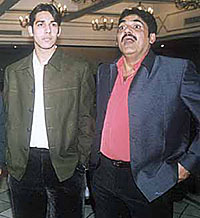 Senior Delhi and District Cricket Association official Ravi Khanna with Akash Chopra at a reception hosted by the National Cricket Academy vice-chairman C. K. Khanna in New Delhi. National Cricket Academy (NCA) vice-chairman C. K. Khanna, who is also the vice-chairman of the Communication and Co-ordination Committee of the BCCI (Board of Control for Cricket in India) felicitated Indian cricket star Akash Chopra at an impressive function in New Delhi. Bhiwani Zila Parishad chairman Seema Lamba said that games were must for growing youths as they develop spirit of discipline among them. HDFC Bank defeated Gillette India by 21 runs in a tantalising final of the ESPN Star Sports Challenger Cup Cricket Tournament. Twenty-five leading corporate teams participated in the six-week long tournament.